Holy Love Handles. I just discovered pure vegan foodie gold and it’s in the form of a spicy cashew cream sauce. I actually discovered/made this last week but I have poured/dunked/drizzled/splashed this all over every meal ever since. Wow! There is no stopping me. I think it’s healthy. I really do. But it doesn’t taste like it. That’s a good thing right? Seasonings: the usual suspects – dry basil, dry oregano, garlic powder, smoked paprika, turmeric, salt, & pepper. Slice your Brussels sprouts, remove ugly outer leaves, drizzle with olive oil, salt & pepper. Spread on a lined baking sheet and pop in the oven 425 degrees for 15 mins. Mix around halfway through. Part 2: Cook your fettuccine in a well salted and oiled pot of boiling water. Drain. Set aside. Part 3: Spiralize your zucchinis and sauté in the empty pasta pot with a little bit of olive oil, salt pepper, smoked paprika, lots of dry basil and oregano for just a few minutes. Set aside. Soak raw unsalted cashews in hot water for at least 30 mins or up to 6 hours. I did 30 minutes because patience is not my virtue. You do what you need to do. Drain cashews and add to a food processor along with turmeric, salt pepper, & garlic powder. Pulse and blend while adding water a little bit at a time until you get a nice creamy texture. It will happen so fast. Blend more. And voila! 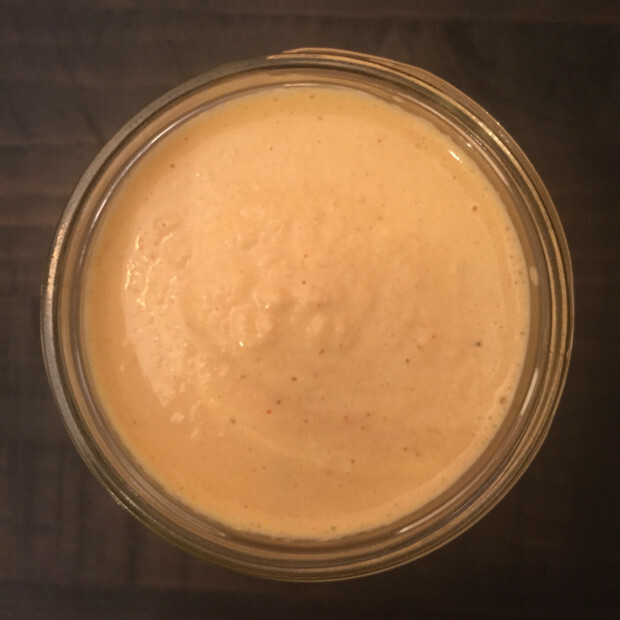 Spicy Cashew Cream Sauce!!!!! 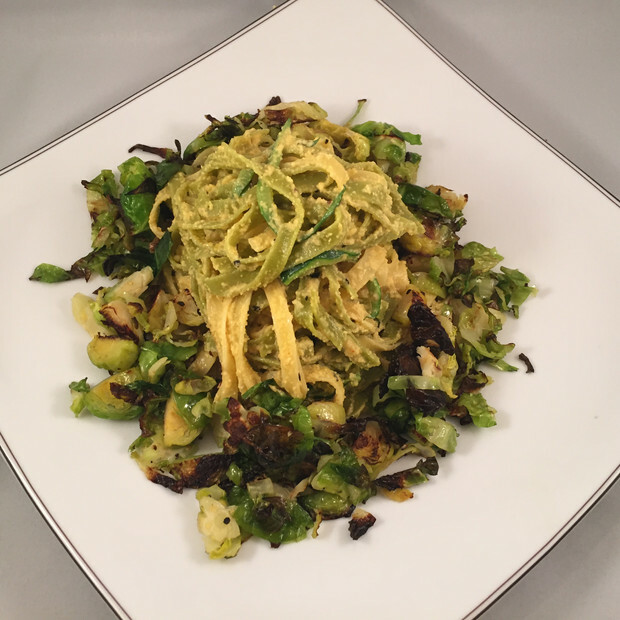 Mix pasta with zoodles. Pour over entire mason jar full of cashew cream sauce. Place it on a pretty plate. Cover with your crispy Brussels sprouts. Or don’t. I won’t judge you. Maybe a little. My love handles have been happy all week! Yours will be too.Enjoy it VEGANLY much!